Princesses Behaving Badly: Real Stories from History Without the Fairy-Tale Endings by Linda Rodriguez McRobbie is a series of non-fiction mini –biographies of famous and infamous women of royalty. Ms McRobbie, a journalist, who lives in London and tries to uncover the many mysteries of life which affect us all, such as how do nations choose which side of the road to drive on and what happened to Marie Antionette’s children. 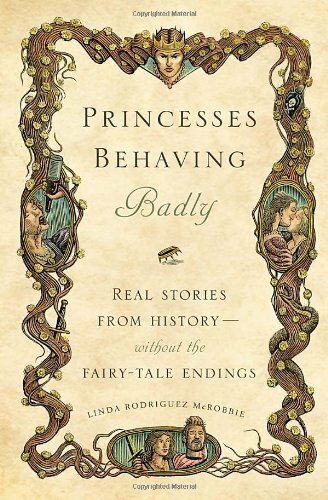 Princesses Behaving Badly: Real Stories from History Without the Fairy-Tale Endings by Linda Rodriguez McRobbie is an interesting, witty collection of the adventures and misadventures of Princesses who do not fit the Disney mold. The min-bios are a wonderful introduction to these fascinating women, each of whom would most likely make a fascinating biography. The book made a point that being a princess several hundred years ago, and one could also argue that today as well, was not easy. The ladies were played as pawns, being married for strategic alliances at a very young age, had to deal with infidelity, court intrigue, wars, politics and more. A wrong move could cost them their dowry or their heads. But the book doesn’t only follow the spoiled brats, but also the strong princesses, those that led armies or courts. Finally, Ms. McRobbie also writes about those women who pretended to be princesses (Anastasia for example) and those who were simply not in their right minds. The author’s writing style is spicy, witty and quick. Each princess gets a few pages in which the author tells about her, a few highlights of her life and why she “made” the book. While it’s certainly not a comprehensive biography, the samples are an excellent introduction to these real life princesses and the age in which they were born. Each section consists of 3-5 short mini-biographies. I love reading historical romances, especially if they are about behaving badly. Although I live a fairly quiet life style, I love reading about people that had a more interesting life. Thank you for giveaway.